The UK’s exit from the EU would allow garden centres and plant nurseries to sell Japanese knotweed and other troublesome non-native invasive plant species. It is currently illegal to plant Japanese knotweed on someone else’s property. However, if the UK were to exit the EU, this would change, allowing those harbouring a grudge against an individual, group or organisation to seek to cause mischief by planting it on their land. 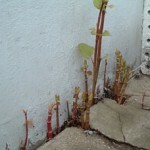 Currently, it is EU law that prevents damaging and dangerous knotweed from being sold to the general public in the UK. With the dropping of these laws if the UK were to exit Europe, there would be no barriers to sellers seeking to cash in on demand from vexatious individuals looking to cause sabotage by planting knotweed wherever they choose. These concerns are amplified by worries that Eco-activists are planning to obtain knotweed propagules to contaminate wide expanses of land in order to make them unsuitable for development; the massive remediation costs forcing developers to drop their plans. This could just be the tip of the iceberg in the ever expanding toolbox of the phyto-saboteur. Rumours abound that plant species such as Kudzu, which make knotweed look like pansies and which have so far been kept out of the UK by our cold and wet winters, could be appearing here soon due to the favorable growing conditions afforded by climate change.